Successful designers are those that have the discipline to edit their work. Generating gameplay ideas is exciting and easy; discerning those with potential and removing the rest takes resolve and vision. But you’ll never get where you are going if you walk down every road — you must cut! Removing game elements is usually straightforward. They are almost always part of a collection of similar elements, so they can be compared on an apples-to-apples basis. They are often specific instances of a general system — the Assault Rifle is an instance of the Weapon system, the Goblin is an instance of the enemy AI systems — which means that most of the work that goes into them can be applied to other elements and isn’t wasted. An element is associated with a certain amount of work that must be scheduled for the models, textures, effects, sounds and animations, so it is easy to measure its impact on the overall scope. And finally, since an element is by definition discrete, it can usually be removed with virtually no impact on the rest of the game. Answered honestly, this question has far-reaching implications. If a player never uses a mechanic, it might as well not exist in the first place. If a player fails to realize that a mechanic exists, it is too subtle or the game is overly complicated. If a player refuses to learn a mechanic, it probably doesn’t fulfill a fundamental aspiration for them — they will never be interested. If a player is unable to learn a mechanic, it is probably unintuitive or it clashes with other aspects of the game. If the designer cannot distill a mechanic down to teach it, they likely don’t understand the mechanic themselves. If a mechanic can only be learned through explicit tutorial, it probably has an awkward or obscure control scheme. Any of these problems are fundamental enough to warrant removal. On the other hand, if a mechanic can be taught effortlessly — or better yet, players discover it on their own — or if mere awareness that an experience is possible is enough to motivate them to learn how to access it, this is a sign that a mechanic is reaching them on a subconscious level. This kind of mechanic can be integrated into their thought process and lead to a fluid flow experience. This entry was posted in Design Sense, Discipline, Gameplay, Mechanics and tagged constraints, editing, simplification, usability. Bookmark the permalink. 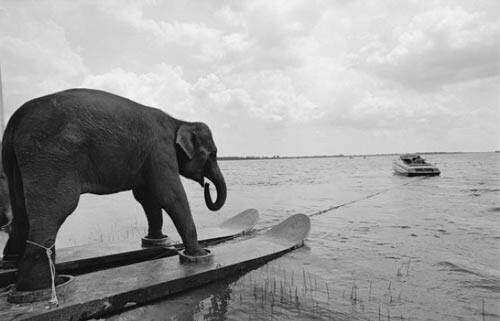 I think the only thing really wrong with teaching elephants to waterski is getting them into focus groups to talk about the experience afterwards. I used to think that picture was hilarious, until I realized that the poor beast is literally chained to the skis. Now I just see it as a sad metaphor for how bad designers treat the player like a circus animal and make them jump through fiery hoops. Thanks for reading, GAFers. But please don’t use my blog to defame other designers, especially friends and colleagues. Besides, this post doesn’t even apply to bloom, since increasing the size of the crosshair is a great way to communicate weapon inaccuracy, so it passes “the question”. You didn’t know it when you made your post, but it directly applies to bloom in every conceivable way. 1. Is the mechanic fun? No. 2. Should we implement the mechanic? Not for Halo. 3. Does it clash with other aspects of the game? Yes. A game that requires a minimum of five shots doesn’t require further handicaps to shooting. That’s what the shield mechanic does for the shooting mechanic…it makes bloom egregious. 4. Is a player able to learn the mechanic? Irrelevant when the mechanic is random and made penal considering the nature of online connectivity. 5. Is bloom unintuitive? Some players have no idea bloom exists or how aggressive it is. 6. Can the designer teach bloom? No. Its far too random by its design to teach. What’s worse, one can learn and take care with the bloom, and still lose to those taking no care to control bloom. A game killer. Any of these are fundamental to warrant removal according to you. Its a laundry list of problems that never needed to exist. One of the beauties of Halo was the shooting. That’s gone because they thought far to much about “Can we do it” rather than “Should we do it”. You know this. You’re smarter than that. We all know this. And we wait for the next Halo game. Jaime, it’s Dax from GAF. I really enjoy reading your blog, and I think you’re a very insightful game designer. Every developer should be clamoring to hire you. I just want you to know that I don’t think the posts by Josh Hamrick come from any member of HaloGAF. I am confident, and can vouch for, nearly every one of the regulars from HaloGAF. I just want to make sure HaloGAF isn’t being misrepresented here. I should have said “willing to vouch for.” I can’t guarantee anything, but I don’t think it’s likely anyone from HaloGAF would take your posts in that manner. I don’t want to misrepresent myself as someone affiliated with any group. Certainly not a group that might defend poor game design in the thralls of some sycophantic fanboy dream. Sorry if there was some error. I represent Josh Hamrick’s Bloom Killed Halo Inc. Please delete my posts if the opinions are causing harm to your site. Personally, I think you are a genius and wish you could’ve sat in the room before they green lit the bloom mechanic. You could have saved countless Halo fanatics from leaving the franchise and made millions in DLC sales for Bungie. Bungie needed you in the bloom meeting badly. I just thought maybe you should know why one bad design decision made for no apparent reason can potentially decimate a game’s popularity and fundamentally sour the experience. I’m not afraid of controversy – I’ve caused my share – but this blog is not about Bungie, Halo, or the Reach Community, and I’d hate it if anything I wrote was interpreted as taking potshots at former co-workers. Especially Josh, who is an excellent designer and a stand-up guy. 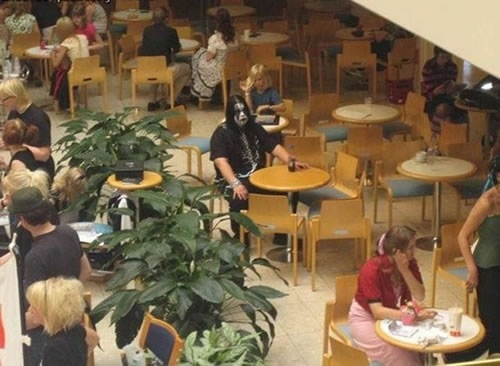 I appreciate your passion, just not your ire. As for bloom, flat-out saying it “isn’t fun” illustrates the futility of debating if a mechanic is “fun” or not, especially in the early stages of development. Bloom is a foundational mechanic of Counterstrike, which is the _most_ fun! Halo 1-3 all used bloom for very high rate-of-fire weapons, so it is hard to claim that it obviously clashes with the gameplay. I think the real weakness of bloom as a Halo mechanic lies in the fact that it is difficult to teach players because they refuse to learn it; bloom doesn’t fulfill any aspirations on their part, so they ignore it even though it impairs their performance. In a modern military shooter, using discipline under pressure to account for weapon kick _is_ part of the fantasy of being a well-trained soldier, so bloom fits. But Spartans are superheroes, aiming problems don’t match their flavor. In that way, the teachability question is relevant, but hard to apply practically. The true crime of Reach Bloom is that the people that aspire to learn it, devote their time to making their pace of fire an art, lose to those who make no such aspiration. Which begs the question, why bother learning how to be a bloom artist if the payoff is losing to someone who could care less about how it was designed. Bloom should’ve been; fire in perfect cadence every time or NEVER score a hit. EVER. Alas, its so rewarding of spam, that it makes the people who try to understand the mechanic think, “Why am I bothering to perfect something when I can still lose being perfect.”. Which leads to empathy. Which leads to taking the game out of the machine. Throw bloom into the mix with AAs, 5 shot kills, no more damage bleed, and you have a confusing weapon that can’t compete in a rewarding way at its intended range, and you’ve lost your game. You’ve lost Halo. Bloom has deeply broken the Halo experience. I want you to know that. I want you to go to bed tonight and really think about what bloom has done to Halo, philisophically. How unnecessary it is for a game with a regenerating shield mechanic. Shields meant Halo could have perfectly accurate weapons. That’s the beauty of the shield mechanic. It enhanced the shooting mechanic. And it was thrown away, for nothing. I wish more thought was given to the damage bloom would do to the core experience. And for what? Puzzling. Good luck with your career. I mean that. I hope you land a great job and learn from the mistakes of others. I wish you had worked on the Reach weapon sandbox Jaime. Farewell. I meant to say “leads to apathy”, not empathy in my above post…whoops. Anyway, take care Jaime and good luck.